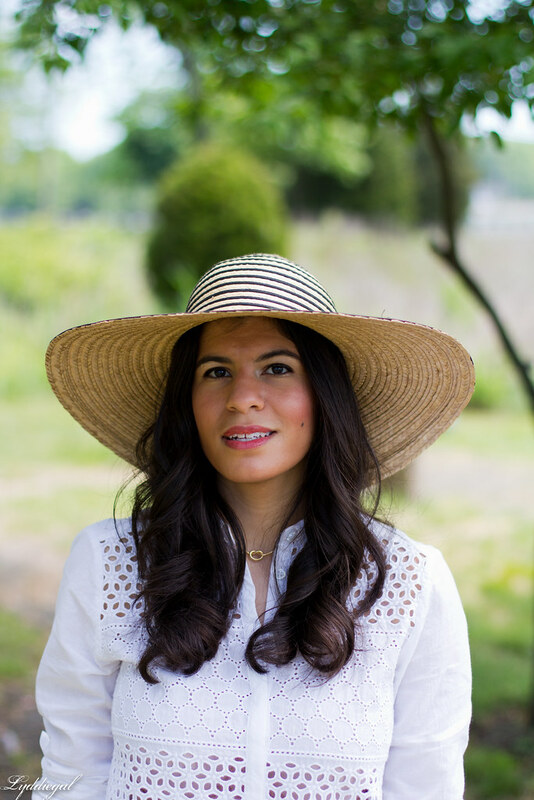 I love the idea of showing a little skin through the cutouts of the eyelet lace, and decided to just run with the stripes by paring the top with the striped shorts then throwing on the striped hat, for good measure, and to keep the sun off my face. 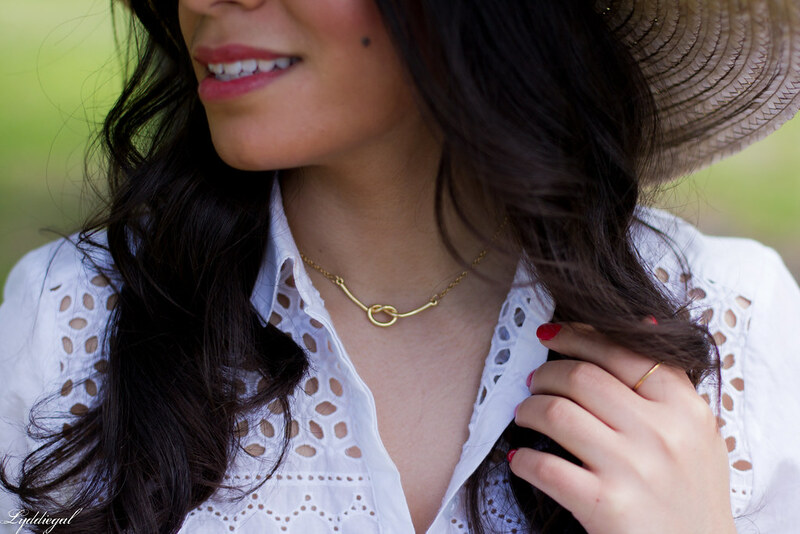 This is what I wore to a picnic, because of course I wear white, and bold costume jewelry to picnics. Man, you do picnics WAY better than I. Seriously, you look so breezy and summery - perfect for some time outside. OMG such a cute Summer look! Soooo in love with that eyelet top! Perfect with the stripes! Well what else would one wear to a picnic? I love every piece in this outfit. The cuff is great, love the stripes on the shorts, the hat is glamorous and I am a huge fan of eyelet! Great gold on the sandals as well! I can imagine its not that hot there so you can actually relax and have a great day outdoors. Perfect top for summer and I love the shorts you wore with it! 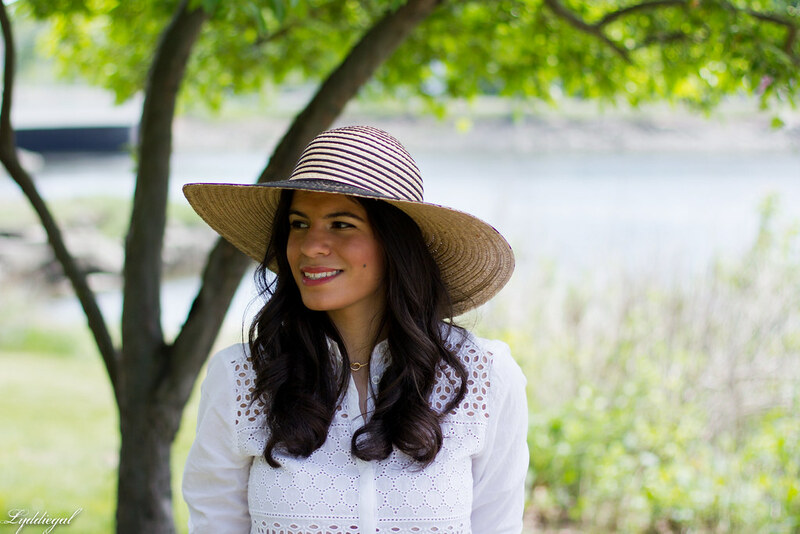 Nothing says summer like white eyelet and this top is perfect on you. Enjoy your Summer. That top is so pretty and summery, and I love the subtle stripes! In fact I love all the stripes you've got going on here--they all work together without it being a stripe overload (if there is such a thing). Wow! Amazing shorts! i love them! Whole outfit looks great :) So summery. I love this top, what a great summer look. You look gorgeous. Love how this shows a peak of skin without being revealing. Perfect for this time of year too. Looks great with your stripes! 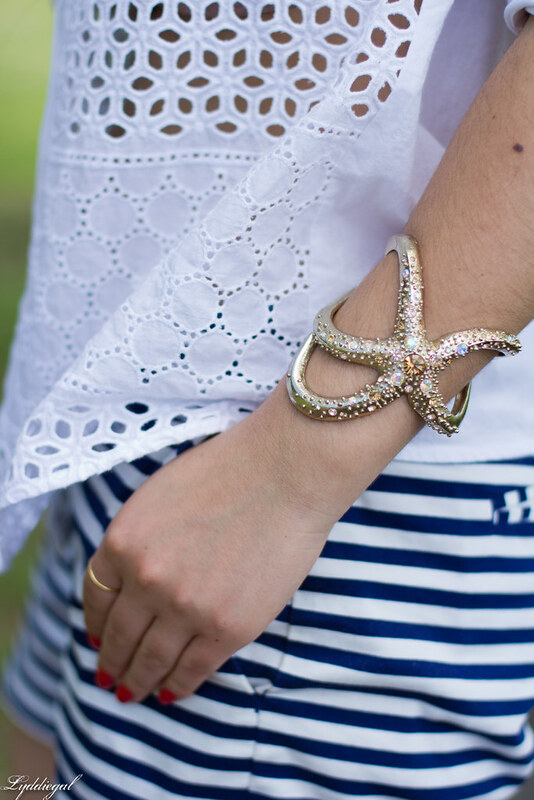 I just love the eyelet and stripes pairing! I would totally wear that to a picnic! What a cute outfit! I recently bought striped shorts similar to yours and once the weather warms up (it's still pretty cold here in Norway, totally out of season) I'll add a lace blouse and floppy hat. Thanks for the inspiration! PS: And you are not the only one who's been going crazy in the shops lately. I can't buy anything more until Christmas! This top is so adorable, I love the different eyelet patterns! The eyelet shirt is so pretty! It's such a nice summery fabric. Love that top and your hat is simply amazing! Have a great morning, sweetie. I love the subtle sexiness of that shirt! I want to steal your hat too - how fun for summer! In love with absolutely EVERYTHING about this look! Hi Lydia! CUTE OUTFIT! Eyelet and Stripes... genius! I love that you thrifted the bag... it's totally something I would have chosen too. I'd love it if you shared your posts with my readers at my Friday Finds Link-Up. Hope you come!